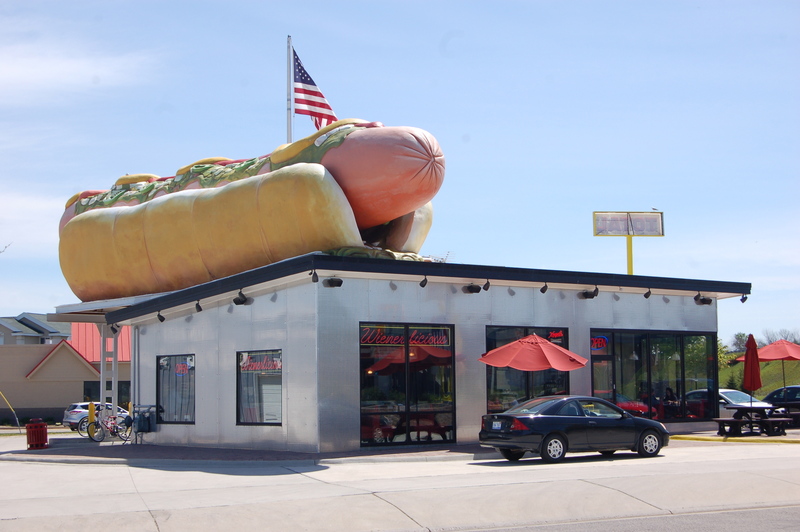 MOUNT AIRY, NC—A 63 foot hotdog sculpture atop a diner called Wienerlicious in Mackinaw City, MI is attracting all kinds of attention from people passing through on I-75. While the steel, spray foam (SPF) insulation, and fiberglass sculpture is awaiting the word from the Guinness World Records folks about being the “World’s Largest,” MI locals and travelers are pulling off to see the oversized roadside oddity at the base of the famous Mackinaw Bridge. 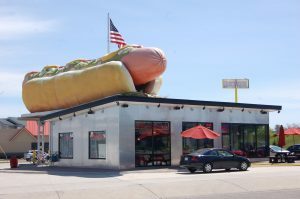 When the Wienerlicious owners, Frank N Stuff Inc., wanted a giant hotdog atop their new building, they didn’t have far to look for the guy to make it happen. They chose the same artist who created a 30-foot tall grizzly bear just up the street in Mackinaw City, Ron Berman of Berman Studios, Inc.